Rabbi of Barcelona; flourished in the beginning of the thirteenth century. During the lifetime of R. Nissim Gerondi, Shealtiel Gracian was rabbi of Fraga, Spain. Owing to his great learning, he was nominated rabbi at Alcala, and the Jews of that town made him swear that he would never leave them. Shealtiel afterward regretted his oath, and applied to R. Nissim and his pupil, Isaac ben Sheshet, to absolve him from it. Both refused; yet afterward, probably after R. Nissim's death, Shealtiel is found at Barcelona. 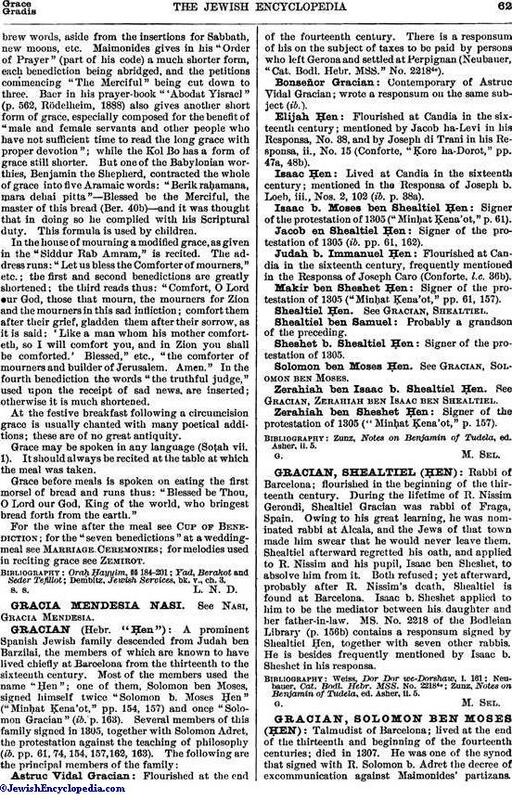 Isaac b. Sheshet applied to him to be the mediator between his daughter and her father-in-law. MS. No. 2218 of the Bodleian Library (p. 156b) contains a responsum signed by Shealtiel Ḥen, together with seven other rabbis. He is besides frequently mentioned by Isaac b. Sheshet in his responsa. Zunz, Notes on Benjamin of Tudela, ed. Asher, ii. 5.